DEFY Wood Oil for Decks is a compatible formulation for use on wood substrates that have previously been treated or stained with Bio-Wash Natural Deck Oil™. 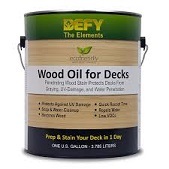 DEFY Wood Oil for Decks with its VOC compliant water-based formula penetrates deep into wood fibers providing maximum long-term protection from weather damage and offering color retention superior to conventional oil-based stains. When properly applied, DEFY's excellent penetration helps eliminate surface build-up and peeling. DEFY Wood Oil for Decks is a long-lasting, semitransparent wood stain specially formulated for use on all types of decking materials including cedar, mahogany, redwood, pressure treated lumber, exotic hardwoods and composite lumber. DEFY Wood Oil for Decks is available in 3 semi-transparent colors plus a Clear Tone. 1. Because of supply / delivery problems throughout the US Natural Deck Oil™ is near impossible to find. The product has been manufactured overseas for the last several years. If you do locate a supply there is a good chance it is older, seasoned and/or leftover material. 2. DEFY Wood Oil for Decks is formulated and color matched to work with an existing Natural Deck Oil™ application. Because this manufacturer has been producing quality deck stains for many years and resides in US Indiana, this item should be more readily available for future applications / maintenance. Hose off deck with garden hose. While deck remains wet spray DEFY Wood Brightener and hose this off after about 15 - 20 minutes. Do not let Brightener dry on the deck. Then let your deck dry completely before applying a single coat of DEFY Wood Oil for Decks. Let the stain set/cure for approx. 24 hours before using.